words by Fiona Symington-Mitchell. Photos courtesy of Band of Bandits Jerky. “You don’t have to ride a horse to be a cowboy” says Johnny Hoxton of Band of Bandits Jerky. Creator of this new British jerky, he’s bringing this all American classic to London using natural marinades and organic beef. “Once you’ve tasted the real thing, you can’t go back” is how he describes the experience of eating real jerky. Essentially an air-dried meat, it was food for the trail, made for and eaten by cowboys. 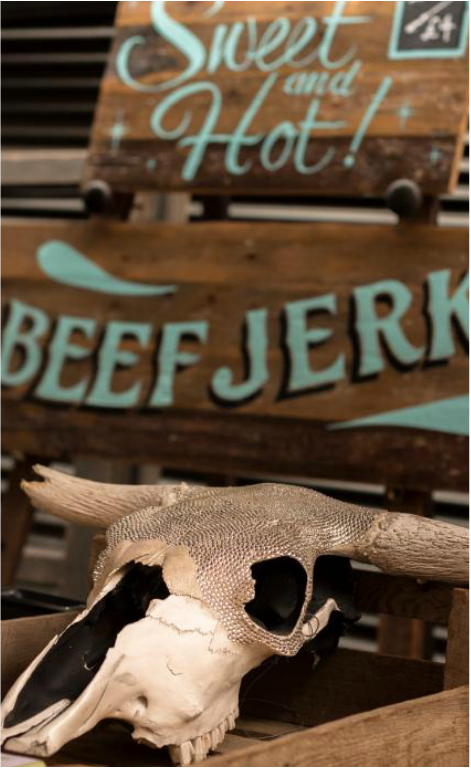 While most commercially produced jerky is preserved with nitrates, preservatives and artificial flavours, traditional jerky was 100% pure beef. Having tasted the real thing in the States, John decided to make his own. For six months, he experimented at home, sharing the results with friends, including South African workmates, and his neighbour -Eddie Ruffett, a stallholder at Maltby Street and now his business partner. Everyone agreed that it was the best jerky they had ever tasted even the dieheart biltong lovers. So when a free one-day spot at Maltby Street came up, John hung up his shingle - a hand-painted sign made by a friend, and sold out by high noon. (The market closes at four.) He and Eddie were offered a regular stall on the spot. For Johnny, the success of Band of Bandits is its taste. “It has big flavours,” he says of his range of jerky. He mades his own cold marinades, leaving the beef for 72 hours as opposed to the standard 6-24 hours. You can really taste the difference. 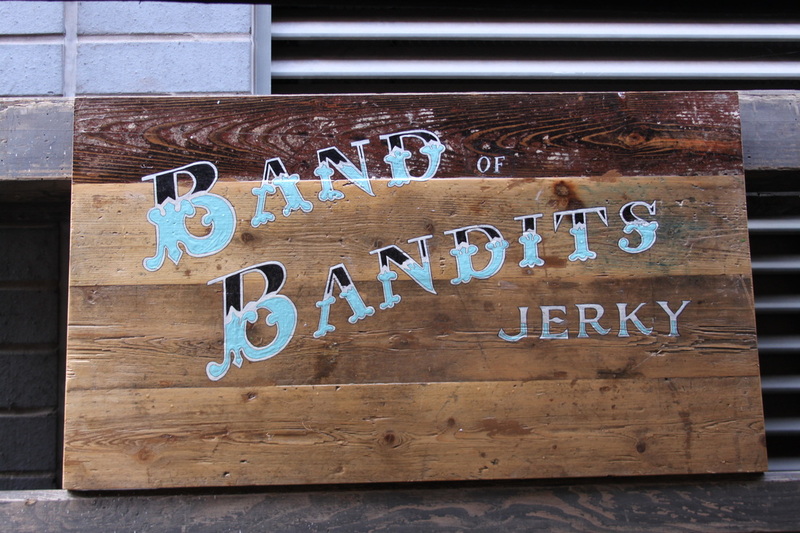 Band of Bandits Jerky is a chewy and very moist strip of beef with a real taste intensity. There are four flavours in the range: original, sweet and hot, teriyaki and Jamaican jerk.“Like a kiss and a punch” is how John describes his personal favourite the sweet and hot, made with a marinade of sixteen different ingredients, including Scotch bonnets and maple syrup. But it’s the Jamaican jerk with its macho heat that sells out first. There are four bonnets per kilo of beef in the marinade. As for British jerky, John adds that “we can’t live off the classic American story of the Wild West”. Instead, there’s the need for a new lone ranger - the British cowboy: an endearing rogue, a character, and one who eats jerky - all four flavours of it. Product branding will reflect this and is in its final stages - Victoriana inspired labels featuring mug-shots of late 19th century criminals. Each flavour will have its own cowboy such as the sweet and hot debonair Clark Gable-looking poacher to the dexterous pickpocket of teriyaki. It’s one of the most vibrant and thriving food cities in the world. There are so many people experimenting with such different foods and ideas. You only need to google dining experiences in London and you could be out every night. You’ll find some organic olive oil from The Gay Farmer who has a stall at Maltby Street. He sources it from his family’s farm in north west Murcia, Spain. It has a great nutty flavour. Beavertown Brewery does some amazing IPAs. I like to have those in my larder as well. The jamón ibérico at Bar Tozino is out of this world. It’s a tapas-style bar at Maltby Street. It’s a very dangerous place. You go in when it’s light and you emerge several hours and its dark - everything there - the sherries, wine, hams are very good. bar tozino, Lassco Ropewalk, Maltby St, SE1 3PA.